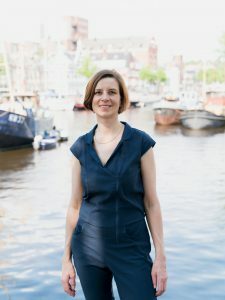 Brain researcher Marie-José van Tol will join the Young Academy of the Royal Netherlands Academy of Arts and Sciences (KNAW). The Academy organises activities in the fields of science and society, interdisciplinarity and science policy. In total, ten talented scientists from different disciplines will join the Young Academy in 2019. Marie-José van Tol (1980) examines the role of brain and cognition in the emergence and persistence of mental disorders, such as depression and anxiety, and in specific symptoms such as suicidality at the Cognitive Neuroscience Center. With her team she aims to improve the treatment and prevention of psychological problems, for example by predicting for whom the treatment works best. Furthermore, Van Tol is committed to involving a larger audience in science. In 2017, she, together with the Brain Foundation, set up a public laboratory in which they showed and provided the experience that people in an irritable mood unwittingly pay more attention to negative information than to positive information. At the Young Academy, Van Tol wants to explore among other things the impact of small and larger collaborative grants on the careers of young researchers. Earlier this year, Van Tol won the Heineken Young Scientist Award. The Young Academy is a dynamic and innovative group of top young scientists and scholars with outspoken views about science and scholarship and the related policy. The Young Academy organises inspiring activities for various target groups focusing on interdisciplinarity, science policy, and the interface between science and society. The official installation of the new members takes place on 21 March 2019, and the membership lasts five years. UMCG-geneticist Lude Franke is also a member of the Young Academy.